Here at Shoeboxed, we’re passionate about the community where we live and work. Durham, NC, is a unique, vibrant place that we’re proud to call home. Recently, we’ve been talking to our friends at other local companies like Coursefork, The Startup Factory, American Underground and others to come up with meaningful new ways to give back to our local community. Out of these conversations, the Startup Giveback was born. The Startup Giveback is a community cookout event aimed at allowing people to build their businesses and their community at the same time, all while having fun with friends, family and colleagues. The first event will be held on Saturday, November 16, 2013 from 1p.m. to 4p.m. at Shoeboxed HQ at 112 Broadway Street, Suite B, in downtown Durham. 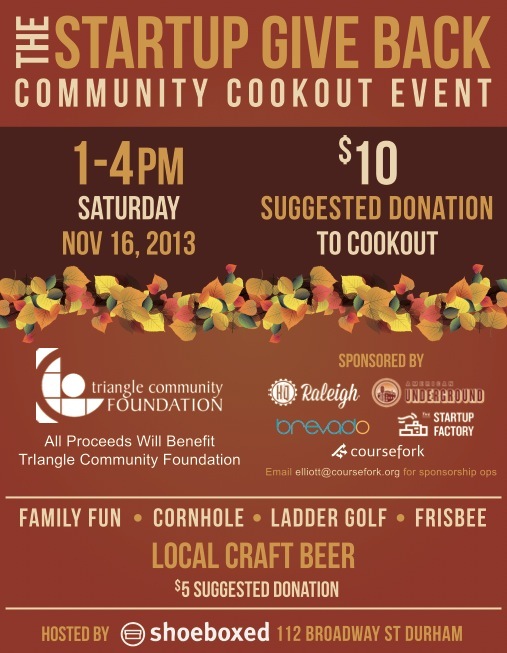 Proceeds from the event will benefit the Triangle Community Foundation. There will be a $10 suggested donation for free food, and local craft beer for a $5 suggested donation. 100% of the gross proceeds will go directly to Startup Endowment. RSVP now! $50,000 to endow the fund so that it will provide a reliable resource for area charities. 1000 entrepreneurs to pledge 1% of the equity they hold in their companies to our fund. And these are just the goals for 2014! Stay tuned for more opportunities to support the Startup Giveback and get involved. 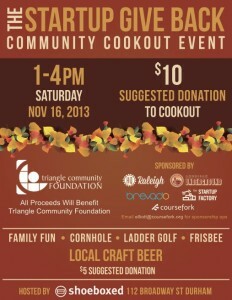 We hope to see you at the event on Saturday, November 16! You can learn more about the event and RSVP here. 2008: Worst Holiday Shopping Season Ever?